Woohoo! The hooligans and I are on a roll with our A-Z Paper Plate Crafts series! 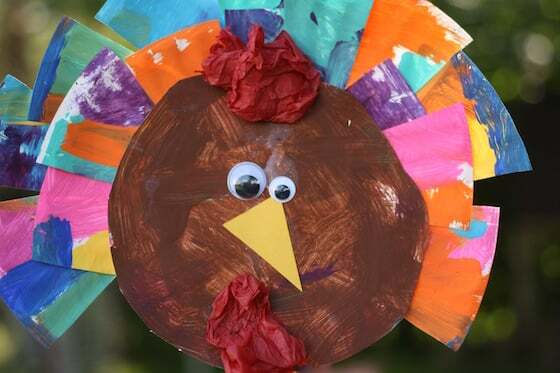 We’re on a roll with our Thanksgiving crafts too! Here in Canada, Thanksgiving takes place in October. For those of you in the US, you have another month or so before celebrating, but I hope you’ll keep this craft in mind. You’ll want to check out our adorable wine cork turkeys too! We made those the other day, and they’re pretty cute. 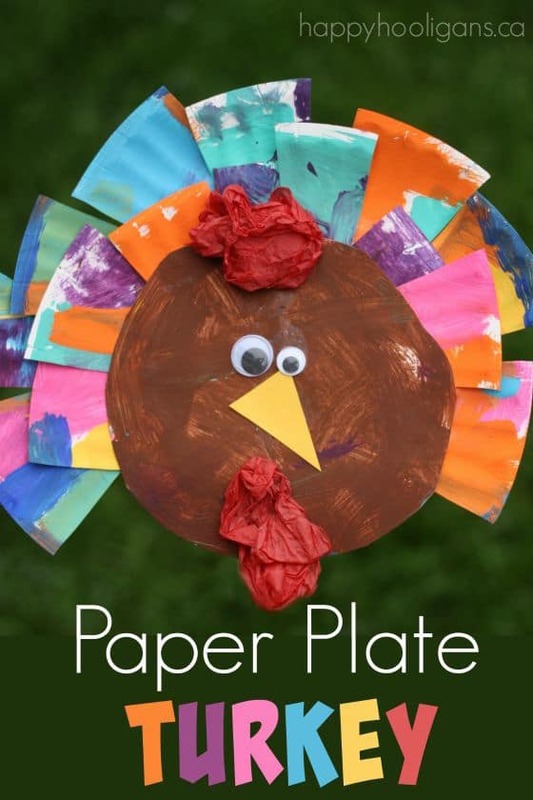 We’ll have even more turkey crafts to share with you in the days to come, but today, I’d love to show you the simple, and colourful paper plate turkey craft that you can make with your toddlers and preschoolers. 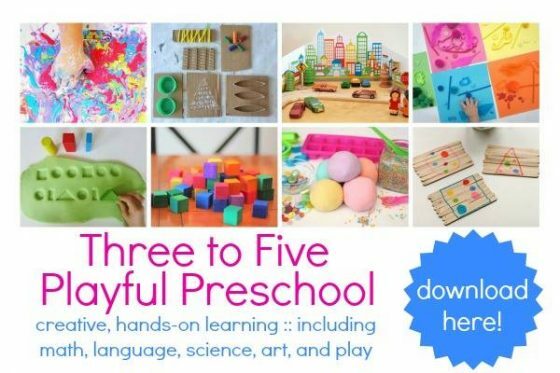 This is a great craft for kids to make for Thanksgiving, or it’s a terrific Letter “T” Craft for preschool or homeschool. 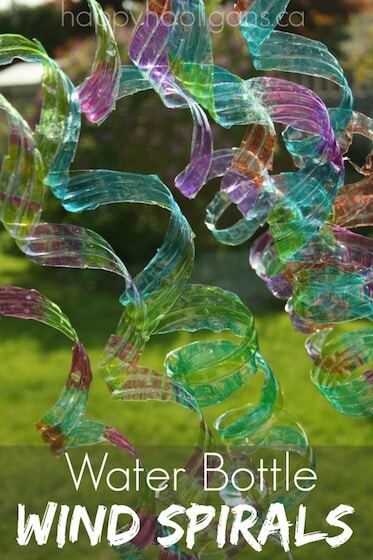 As you may know, we’ve made tons of paper plate crafts over the years. 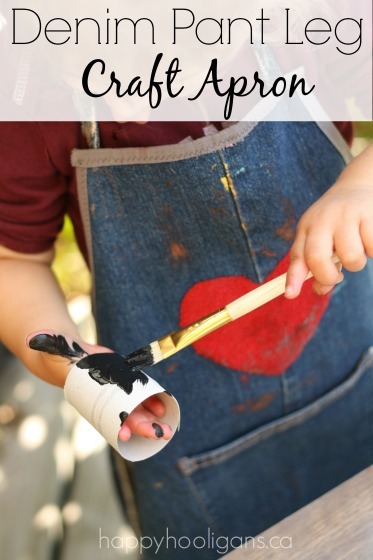 I love crafting with paper plates because they’re inexpensive, and with a little imagination, you can turn a paper plate into just about anything. For your convenience, this post may contain affiliate links. 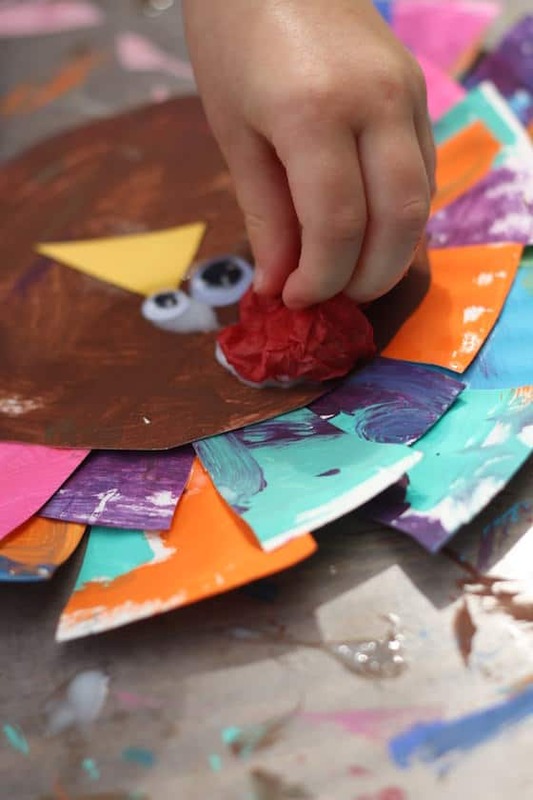 The inspiration for today’s turkey craft actually came from a combination of a couple of other paper plate crafts we’ve made – our paper plate flowers and our paper plate spiders. 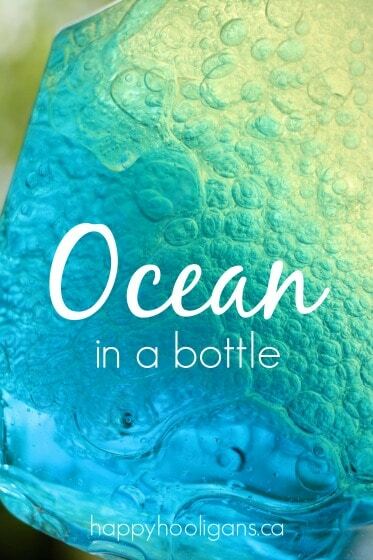 We’re using a similar technique today. 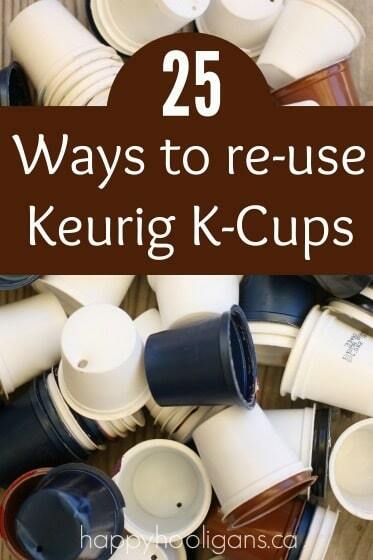 Let’s round up the supplies, and get you started! 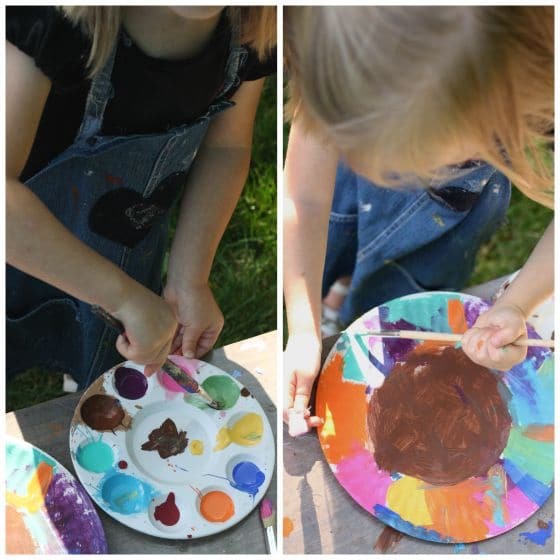 Have your child start by painting the paper plate. 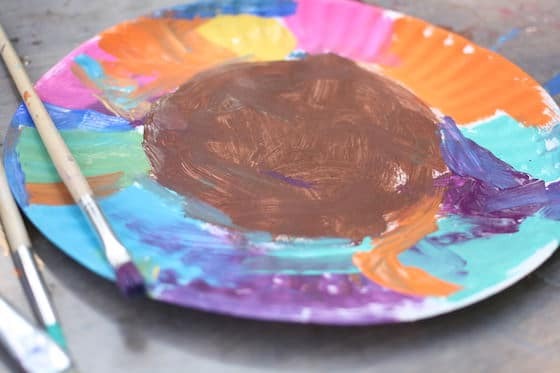 Paint the middle of the plate brown (for the turkey’s body). 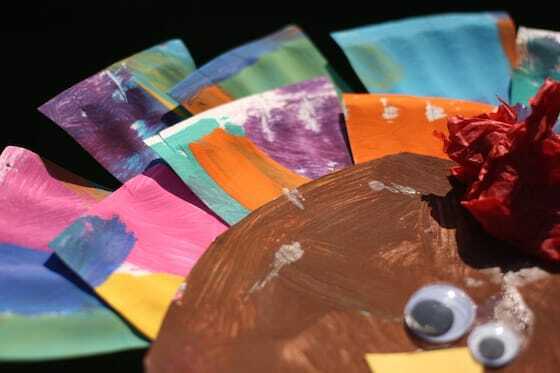 The rim of the plate will be cut up into the turkey’s feathers, so you want it to be nice and bright and colourful. I let my hooligan choose as many colours as she wanted for the tail feathers, and I poured a bit of each colour into a small paint pallet for her to work from. She had a super time dabbing and brushing all of the colours onto the plate. 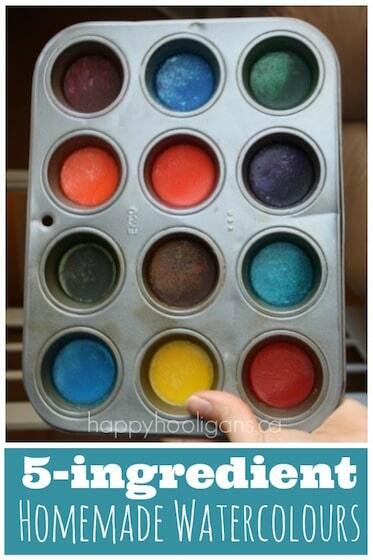 I always put out enough paint brushes that the hooligans can have one for each colour of paint. It eliminates the need for us to rinse our brushes before a colour change, and it keeps the project and the paint pallet from becoming all mixed up. 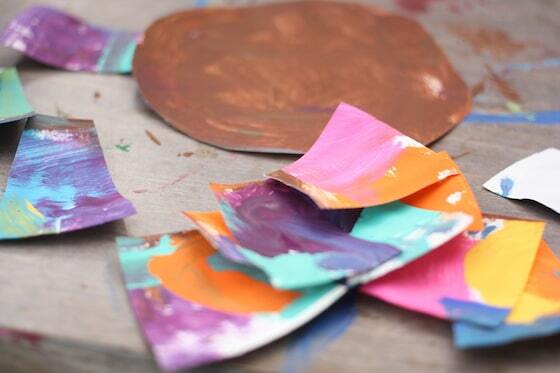 When your paper plate has been completely covered in paint, grab the scissors! I helped my hooligan with the cutting part, as she’s still learning to use scissors. Cut the colourful rim of the plate off, so you now have two parts – the brown body and the colourful rim. Now have your child chop the rim up into chunky pieces. These pieces will serve as the feathers. Flip your plate over, and glue the feathers in layers around the edge of the brown body. 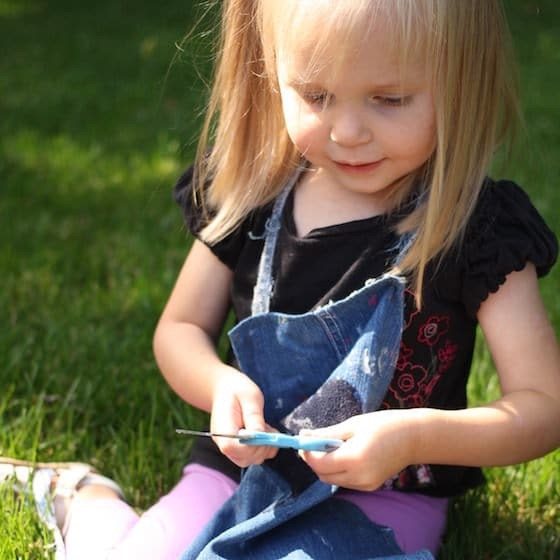 Then your child can add the eyes and beak, and a couple of pieces of crumpled tissue paper for the comb and the wattle.